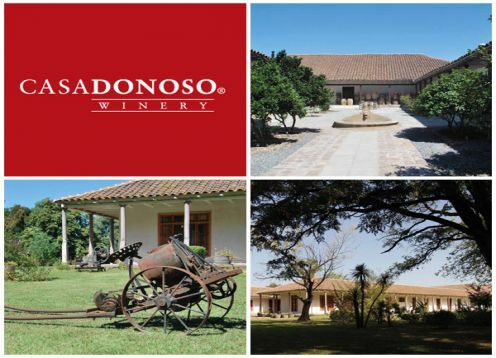 The origins of Viña Casa Donoso back to 1989 when a group of foreign businessmen are delighted with "Fundo La Oriental" a "domaine" in the heart of historic Maule Valley, in the seventh region of Chile. He belonged to Dona Lucia Donoso Gatica, an extremely charming woman, who not only inspired one of the first bottled wines, "Dona Lucia," but the very concept of Viña Casa Donoso, facing a traditional production of red and white wines in the style French. In this work the wines today represent Viña Casa Donoso, which highlights the icon wine Casa Donoso "D" and Premium wines Casa Donoso Clos Centenaire and Casa Donoso 1810, in addition to its wines Gran Reserva and Reserva Evolution Bicentennial arise. Over the years, the size of the vineyard has doubled, while others terroir are incorporated in the area of ? ?San Javier, slightly south of the initial founded the Oriental, in the same region of Maule and San Vicente, north of East, totaling 472 hectares more to existing ones, thus making a total area of ? ?710 hectares. Since early 2011, Viña Casa Donoso has new owners, who have maintained the tradition of producing wines classic with known Cabernet Sauvignon, Carmenere, Merlot, Sauvignon Blanc and Chardonnay with which the best brews are made in its icon lines , Premium, Gran Reserva and Reserva, with significant presence in all five continents.